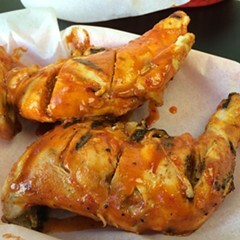 A South African chain selling Portuguese-style chicken slathered in a spicy chili-pepper sauce. 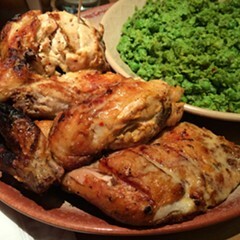 Based on the throngs crowding into Nando's it's clear that peri peri chicken's powers are not to be dismissed. The large space swarms with people, and if you're hungry and of a delicate constitution, you might just sense a case of the vapors coming on. It doesn't help that Nando's has a large and varied menu, full of nonsense like mushroom wraps, steak sandwiches, veggie burgers, frozen yogurt, and raspberry cheesecake. Never mind all that. 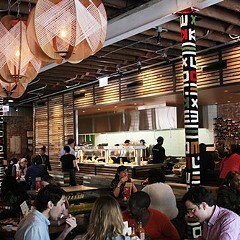 The only appropriate order is the chicken, which can be ordered in a variety of spice levels. The pieces are scored and grilled—just kissed, really—before being lightly sauced. There's nothing extraordinary about them, but the sauces themselves are pretty wonderful, and you can douse the bird to your heart's content at the sauce station, where individual bottles of wild herb, lemon and herb, mango lime, garlic, mild, medium, hot, extra hot, and extra extra hot are stocked. This is the key to Nando's world dominance, because while the smallish, hastily grilled chicken itself is nothing special, the sauces are.